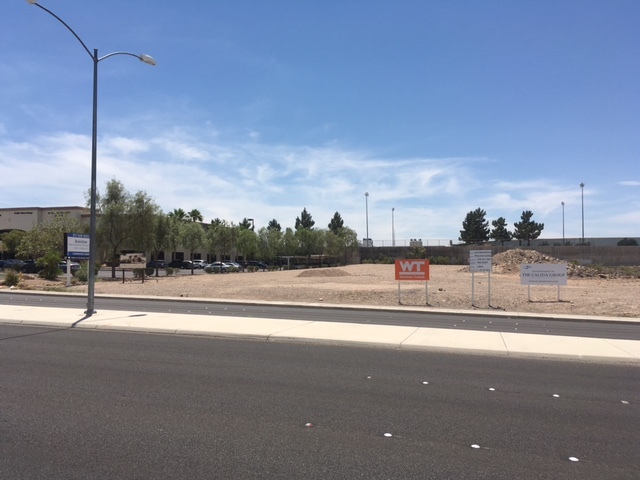 HENDERSON, Nevada (June 13, 2016) — The 2.26 acres at 2895 West Horizon Ridge Parkway in Henderson may someday become a memory care facility – a use for which the City of Henderson approved a design in December 2014. Or it could be used for an office, retail or something else entirely, depending on the plans of the next owner. The property, at the busy corner of Horizon Ridge Parkway and Rich Perez Jr. Drive, is being sold in an online auction, with a nominal opening bid of $1 million. Auction Markets is marketing the property and conducting the online auction, for which bidding will open on June 23. “This is one of the few remaining tracts available in a very vibrant neighborhood that includes a high school, medical offices, restaurants, offices and financial institutions, as well as surrounding neighborhoods. With its current zoning of Neighborhood Commercial, this land has amazing versatility and potential. The approved use for a memory care facility is just an added bonus,” said Stephen Karbelk, president of Auction Markets. The site has 234.52 feet of frontage on West Horizon Ridge Parkway and 353.16 feet on Rich Perez Jr. Drive. “When you have this kind of visibility, fronting on a busy road in a good market like Henderson, there’s no shortage of attractive options. It’ll just be up to the new owner to decide how to best make use of it,” said Karbelk. Bidding for the site will open on Thursday, June 23, and will continue until 2 p.m. Pacific Time on Thursday, June 30. Bidders must register to bid and be pre-approved by the online auctioneer prior to bidding. Additional information, including terms and conditions, may be found at AuctionMarkets.com or by calling 571-481-1037.